At the end of October last year, I shared with you one of my favorite organizational hacks: the one minute rule. Essentially, the one minute rule suggests that whenever you come upon a task that you can complete in under one minute, you should do it without hesitation. Don’t pause to consider, and don’t tell yourself you’ll do it later. Instead, take a few seconds and accomplish the task right then and there. The beauty of this practice is it’s ability to quickly reduce clutter, and in turn, decrease stress. Because as Gretchen Rubin reminds us, outer order contributes to inner calm. Now, something that always surprises me about the one minute rule is how much I am able to accomplish in just 60 seconds. In fact, after following this practice for several months, I grew curious about what else I could complete in a relatively short amount of time – say, 5 minutes. And if you know me well, you won’t be surprised to read that I started timing myself around the house to answer that very question. But it turns out… they only took 4:37, 4:26, and 4:56 respectively. That’s it! Of course, this revelation fueled my curiosity further as I tried to figure out what other 5 minute chores I could discover. And it turns out, that list is quite long! Empty the dishwasher: 4:31. Vacuum the area rug in the dining room: 1:23. Straighten up my office: 4:57. Heck, I even scheduled routine plumbing maintenance for our A/C in 3:26. I know many of you love the one minute rule as much as I do, so I wanted to share my newest fascination with 5 minute chores as well. 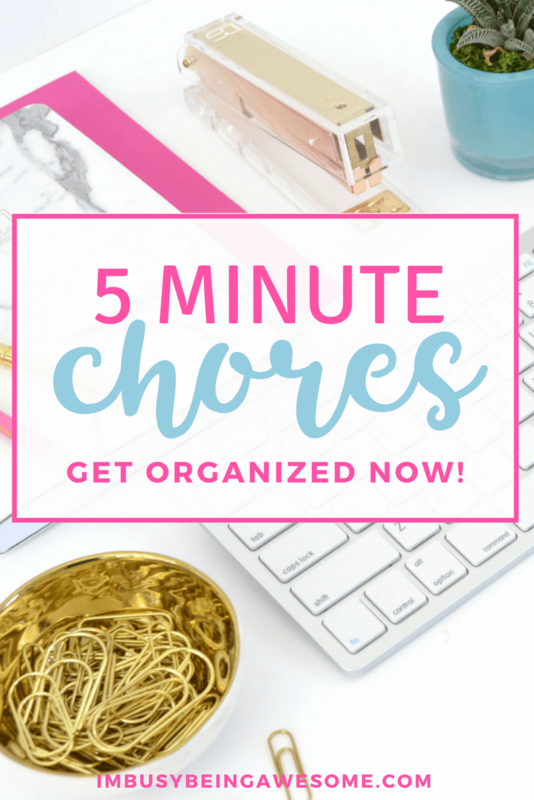 So are you wondering what 5 minute chores you can accomplish? Here’s a peak at 15 tasks that you can complete in 5 minutes or less. And if you’re especially hooked, be sure to download my complete list of 60 5 minute chores here! Clean out and disinfect your sink. Clean out expired food/leftovers from refrigerator. Use a hand duster to clean cobwebs from corners, air vents, etc. Vacuum (upholstered) or wipe down (leather) couch. Organize one dresser drawer. Get rid of items you no longer wear, and refold the items you’re keeping. Put away one load of laundry. Fold the towels in your linen closet. Sweep and swiffer your bathroom floor. Are you eager to keep going? Great! Then download my entire list of 60 5 minute chores here! Do you have any 5 minute chores to add to the list? What is your least-favorite chore to do around the house? Are there any tasks you enjoy (or don’t mind) doing? Let me know below! omg why do I hate chores so much!? even 5 minute ones! But this is a great list to remind me that they only take 5 minutes! 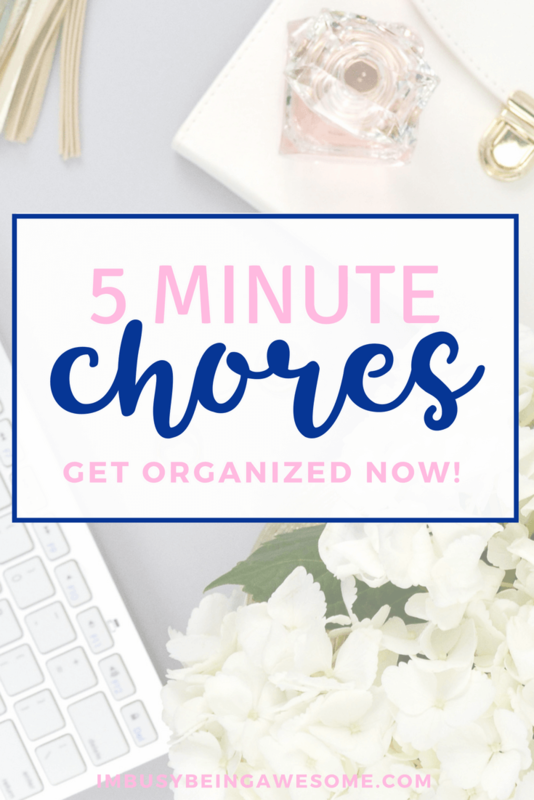 I love that put together this list of 5 minute chores! Cleaning is not my favorite thing to do. Lol and having a quick list of important things I can do in just 5 minutes is really helpful! Thanks! This is so true! The most daunting chores only take five minutes! I love using the timer method! I do this with paper clutter I don’t want to put away! It helps to know I can stop when the timer goes off! It’s so true that so many tasks take a short period of time. Problem is that there are so many, and sometimes, finding even five minutes is a challenge! Definitely something I need to work on : ). I love the idea of accomplishing anything that takes 60 seconds right away. I can’t tell you how many chores I put off that would only take me 60 seconds to do. And then working up the energy to tackle so many built- up tasks feels overwhelming! I love the quote “Outer order contributes to inner calm.” It is so true for me! It’s amazing how much more calm I feel when my environment around me is de-cluttered! Thanks for sharing! Yes, it describes me so well, too. It’s amazing how much of a difference it makes, isn’t it? Wipe down the bathroom sink! This is awesome! I could add feeding the cats or cleaning the dreaded litterbox… cleaning is not my strong suit so I do try to give myself a certain amount of time to clean them take a break. It tends to help me out and I love this list! I can definitely relate; I hate ironing and putting away laundry! I also don’t care for unloading the dishwasher. I’ve never timed tasks before, but I have realized that getting the things I dread out of the way first is very helpful in the area of productivity. And living out of the clean laundry bin gets old quick! LOL I know exactly what you mean; I still get caught from time to time as well :D. Sometimes when you hate a task so much it can be hard to see the benefits of just getting it done already. Great list!!! Thanks for helping to put housework in perspective. It doesn’t actually take For-Ev-Er!!! Thanks! And do I sense another Sandlot lover? This is how I get things done and it does work! I find it now takes me less time to do the big chores too! I love to hear that it has helped speed up your big tasks, too. That’s fantastic! This is great! Great ideas to be more productive and not put things off! Love how you are motivated to get things tackled! I need to be in this mindset of getting housework done. Love this! I am a super busy with 3 jobs and a husband so doing house work tends to be set on the back burner (pun intended;) so doing a 5 minute chore list, which doubles as cardio…that’s incredibly do-able! I love Gretchen Rubin and the One Minute Rule! I do weekly 5 minute cleanings in each room of the house. I’m always surprised how much I can actually get done in the 5 minutes! I think we always build things up to take longer than they actually do! Isn’t it incredible all that we can accomplish in such a short amount of time? I completely agree – we seem to build up the “awfulness” in our heads, when in reality, it takes 3 minutes and we’re done! Ha. I can’t say that I’ve ever timed chores…except with the kids. I give them a task, set the timer and they hurry to get their task finished before the alarm goes off. It just keeps them focused. I guess I should try it myself and see just what I can do in 5 minutes.